This story was updated at 10:13 a.m. ET. A new video has captured an Apple iPad's mindboggling fall to Earth from a balloon in the stratosphere in what may be the ultimate tablet survivor tale. The high-definition video shows the iPad falling from a height of 100,000 feet (30,480 meters), with the blackness of space and the bright curve of Earth providing a stunning backdrop. The device free-falls all the way back to Earth to make a crash landing on a rocky Nevada hillside. The video was recorded by the Rhode Island-based company G-Form, which designs protective electronics cases and athletic pads. 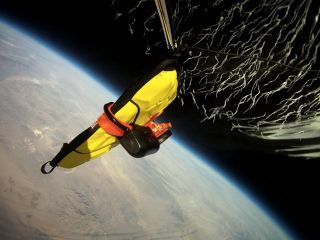 G-Form officials used a weather balloon to carry the iPad up into the Earth's stratosphere, where the balloon burst and allowed its payload to begin the long fall back to the ground. G-Form wrapped the iPad in one of its 6-ounce protective "Extreme Edge" cases to test how well the covering performed in such a long drop. "Perhaps even more remarkable than the dramatic hi-def footage itself is the fact that the iPad survives the adventure, remaining fully functional," G-Form officials said. The company will be showcasing its electronics cases this week at the 2012 Consumer Electronics Show in Las Vegas, Nevada. Cafaro said that the device was "the first iPad that's ever free-fallen from space and survived to play more movies." G-Form Extreme Edge Case encloses an iPad as it falls from space back to Earth. G-Form's stratospheric iPad is not the first Apple tablet to soar into space and its environs. In October, Russia put two iPads in space as cargo aboard a Russian supply ship which launched to the International Space Station. They were reserved for use as entertainment devices for the space station's crew. The iPads joined a set of iPhone 4 phones, which were launched to the space station earlier in 2011 to be used in experiments. Astronauts have also carried Apple's iPods with them on space shuttle and station-bound missions in order to listen to music while exercising, gazing out the window or other down time in orbit. The iPad's stratospheric fall is the latest example of balloon-launched technology carrying custom-built tech to amazing heights. During NASA's final space shuttle missions in 2011, student groups used similar balloons to launch home-made camera platforms into the stratosphere to snap amazing photos of shuttle launches from above. This story was updated to correctly identify the iPhone 4 devices currently aboard the International Space Station.